James Alan Hetfield (born August, 3, 1963) is the lead vocalist, rhythm guitarist and co-founder of the American heavy metal band Metallica. James Hetfield was born on August 3rd, 1963 in Downey, Los Angeles County, California. He is of English, German, Swedish and Irish descent. Hetfield's father, Virgil (a truck driver who later left the family) and mother, Cynthia (a light opera singer) were strict adherents to Christian Science, and accordingly, much of James' young life revolved around Christian Science. In accordance with their beliefs, Hetfield's parents strongly disapproved of medicine or any other medical treatment and remained loyal to their faith even as Cynthia was dying from cancer. When he is not writing, singing or playing, Hetfield enjoys a variety of outdoor activities including hunting, skateboarding, snowboarding, water and jet-skiing; sketching, working in his garage customizing cars and motorcycles, watching his favorite football team the Oakland Raiders, and going to hot-rod shows. He also collects vintage guitars—particularly those from 1963—and enjoys working on classic automobiles. Among his favorites are a '74 Chevy Nova, which he helped restore, and "The Beast", an all-terrain four wheel drive Blazer. He put his 1967 Chevrolet Camaro up for sale on eBay, with the proceeds going to a Music for Schools program. The car was used in the video for "I Disappear" and was given to him as a gift upon the video's completion. Years later, James donated the car to the Hard Rock Cafe which is featured in the movie Hard Rock Treasures. 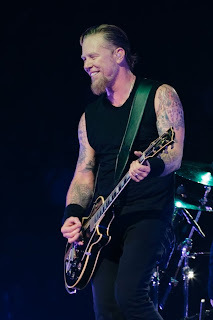 Hetfield has several tattoos, including one which shows flames encasing four cards, - ace (1), 9, 6 and 3 - representing the year of his birth, and the words "Carpe Diem" ("seize the day", also part of the title of the track "Carpe Diem Baby" off ReLoad). The flames from the tattoo are reportedly in reference to the pyrotechnic accident from which he suffered in 1992. He has also tattooed an 'M' on his right hand which stands for Metallica and 'F' on his left hand which stands for his wife Francesca. Aside from these pursuits, Hetfield says he is often happiest spending time with his wife Francesca and their three children: Cali (June 13, 1998), Castor (May 18, 2000), and Marcella (January 17, 2002). Hetfield married his wife Francesca Tomasi on August 17, 1997. During an interview on NPR's Fresh Air, Hetfield stated that his wife had helped him to mature and learn to deal with his anger issues more constructively, explaining that after they met, his destructive tendencies embarrassed both of them. The Hetfield family currently resides in Marin County, CA.